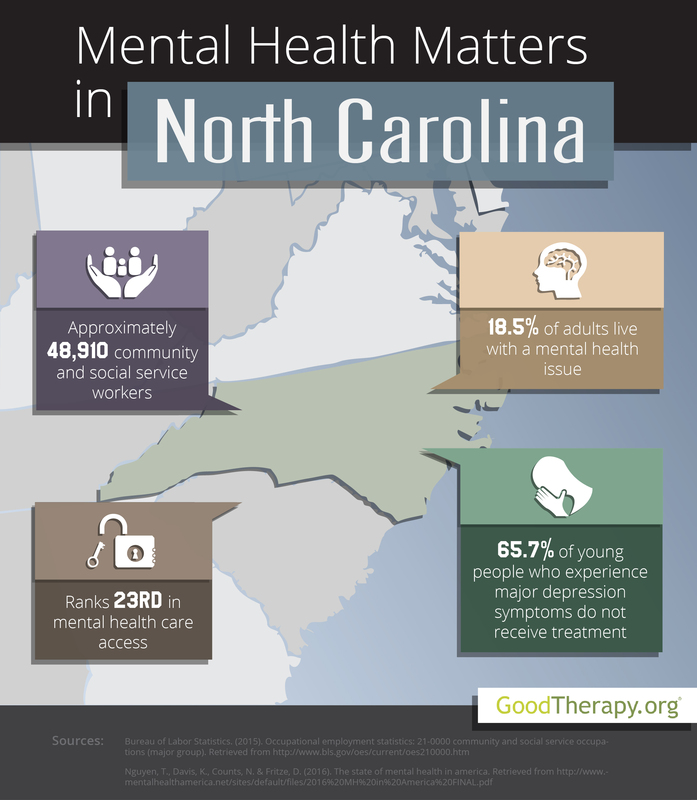 Find a therapist in North Carolina with GoodTherapy.org. As stated by the United States Census Bureau, North Carolina had roughly 10 million people living in the state in 2015. Of this total, it is estimated about 71.2% of residents are white, 21.5% are black, and 2.8% are Asian. Approximately 51.3% of the population is female. The median household income in North Carolina from 2010-2014 was $46,693. According to the Bureau of Labor Statistics, about 48,910 residents were employed in social service, health care, and community assistance fields. Typical jobs within this sector include working as a social worker, parole officer, counselor at a drug and alcohol rehab center, health educator, religious worker, guidance counselor, community health worker, counselor at a residential treatment center, psychiatrist, child psychologist, or a marriage and family therapist. Mental Health America (MHA) analyzes and ranks the mental health conditions of the states and the District of Columbia each year. In 2016, North Carolina received an overall mental health rank of 27th. The state was also evaluated in other major categories, finishing 18th in adult ranking, 36th in youth ranking, 35th in prevalence of mental and emotional issues, and 23rd in access to professional mental health services. For the most part, these rankings show a relatively high rate of mental health issues combined with a relatively low or mid-range rate of access to treatment and care. Research from Mental Health America indicates 1.3 million adults in North Carolina experience mental health issues. While dependence on alcohol and drugs is an issue—with 634,000 adults affected—therapists in North Carolina are also concerned about the relatively high percentage of residents with suicidal ideation. Data from the 2016 MHA study shows 4.3% of adults in the state have serious thoughts of suicide, and North Carolina was given a low rank of 41st in this mental health measure. Adverse mental health issues also affect young people in North Carolina. Therapists and researchers from Mental Health America report roughly 45,000 adolescents in the state are experiencing alcohol or illicit drug dependence, while 64,000 adolescents have severe depression symptoms. With nearly 5.9% and 8.8% of young residents affected by these respective issues, the state was ranked 35th and 45th in their respective categories. Access to mental health care is a concern for many therapists in North Carolina. While the state had the fifth-lowest percentage of adults with mental health issues who did not receive treatment, about 458,265 adults with disabilities could not obtain treatment due to cost. The 2016 MHA survey reports 13.9% of adults who need professional mental health care are uninsured, while 8.5% of children are insured by providers that do not cover mental or emotional health services.